The Summer Research Program provides the opportunity for Wellesley students to work fully-funded in on-campus labs on a variety of projects. Students apply in February; if accepted, they receive a housing and transportation allowance, a summer stipend, and the chance to get hands-on experience in scientific and social science research. Projects range in discipline from Africana studies to mathematics to women's and gender studies; the research produced during the summer often contributes to students’ senior theses and leads to published articles and professional conference presentations. 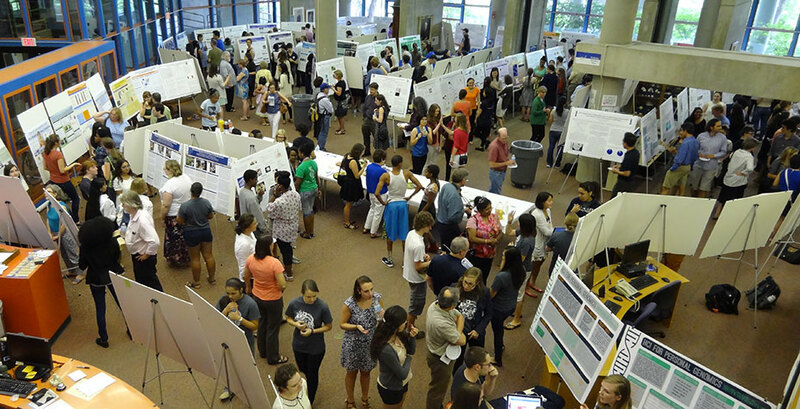 More than 100 posters shared the findings of the students' research, on topics like "Culture of Cancer in Turkey" by Gul Ayhan '16; "Effects of Developmental Pollen Stress on Foraging by Honey Bee Adults" by Anita M. Yau '17, Amina Ziad '17, and Anne Shen '17; "3D Computer Graphics on the Web" by Stephanie Contreras Moran '16 and Kelsey M. Reiman '15; or "The Cellular Mechanisms Underlying Attention" by Jessica Kelemen '16 and Nour Azzouz '15, to name a few at random. Experiences like these prove enormously helpful to students as they progress in their careers. In 2013, the NSF ranked Wellesley as the number one liberal arts institution for producing women earning Ph.D.s in science and engineering. This summer, 122 Wellesley students participated in the program. They were joined by one student from Olin College of Engineering, one from Bowdoin College, two from the University of Washington, eight students from nearby Framingham High School, and 16 Upward Bound participants. In addition to working on the research, each high school student was paired with a Wellesley student mentor.